If you prefer a tailored, fitted look over our more traditional scrunchy Cord Coverup®, then our Wrap Style is for you. It’s easy to apply to any chandelier chain or lamp cord. » Click Here to view our Before and After Gallery. 1. Remove rubber band and Wrap Style Cord Coverup from stick. Discard rubber band and stick. 2. Shorten extra electrical cord length with enclosed twist ties prior to wrapping Cord Coverup around corner. 3. Start with label end of Cord Coverup and begin to wrap fabric around electrical cord or chain. 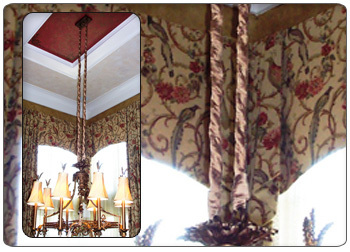 For chandelier, begin from top and wrap toward fixture. For lamp or other cords, begin from base and wrap toward electrical plug. 4. Wrap Cord Coverup as tight or loose for desired look. 5. Wrap Cord Coverup as evenly as possible. 6. Secure finished end of Cord Coverup with enclosed piece of two sided adhesive Velcro. Cut Wrap Style Cord Coverup to desired length if necessary. For finished look, tuck cut edge under and begin to wrap with that end. Use Cord Coverup with UL approved cords.